It's not fall if you're not eating something with pumpkin, apples, or spices, preferably in a plaid shirt and ideally by some sort of cozy fire or surrounded by colored leaves. Ok, I know that last part is probably a little extreme, but....#goals?! 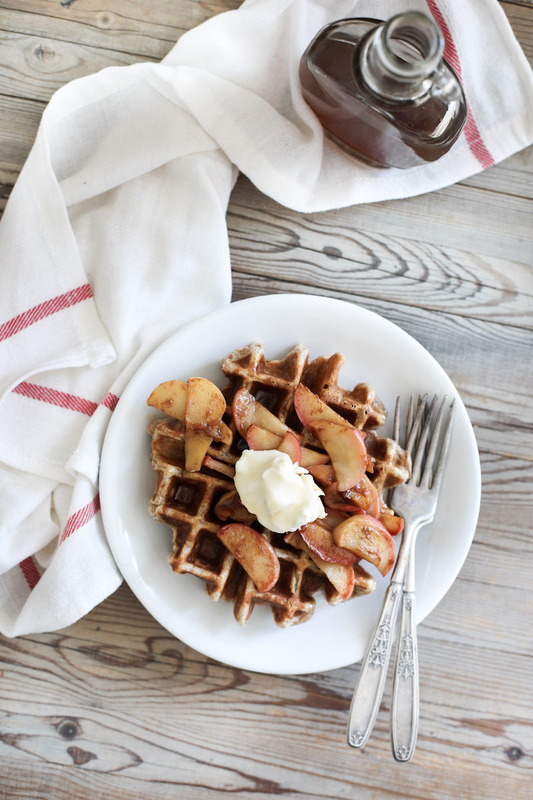 And while we're on the subject of fall goals, let's talk about these spiced waffles with apple compote and bourbon syrup. I 100% realize the fall basicness is on the same level as a Starbuck's PSL, but trust me when I say that these are a 1000% better than any PSL you'll ever have. The waffles are soft and fluffy and perfectly spiced, the apple compote melts in your mouth, and that syrup, well, prepare to have it leave you speechless (especially when you pour the extra on bacon before cooking it, just sayin'). Grab the not-so-basic basic recipe on Sugar & Cloth today, make them immediately, forget how fall basic they actually are and thank me later.